OK, so today I have managed to photograph some of the work in progress. This afternoon is sunny and bright, if a little on the chilly side, so photographs were possible. Unlike yesterday, when it was barely daylight all day. 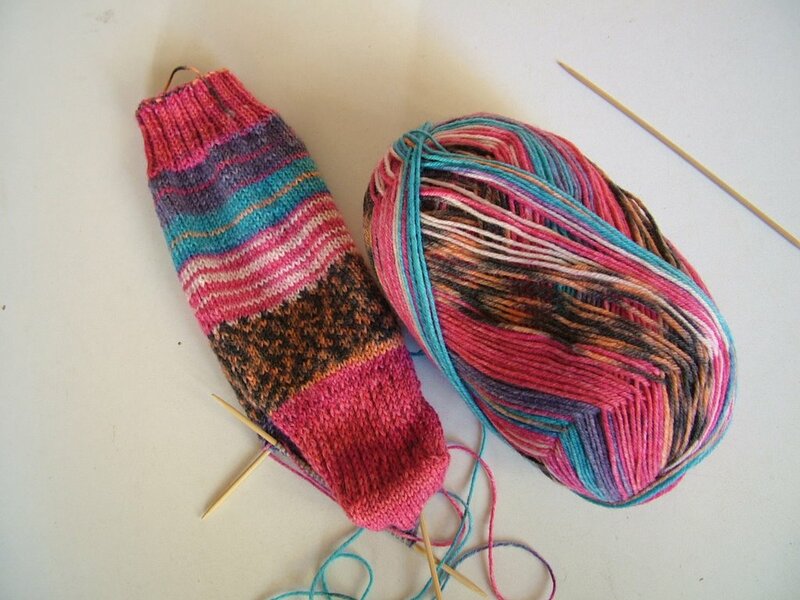 First we have the new Opal socks in colourway 1237 (no idea what that is but I like it). These are my current carry-around project for knitting in my lunch break etc. I love the colours. I'm on the gusset decreases of the first sock. Next we have a lovely scarf / shawl called Kevat (apparently this means Spring in Finnish). I got the pattern from Knitting Pattern Central. 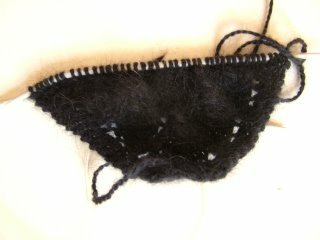 The yarn is Filatura di Crosa Angora in black. It's 80% Angora and 20% Lambswool so it's wonderfully soft and slightly fuzzy. This is going to make it very difficult to knit I expect. I started this yesterday at Brum S&B, where the light is quite good and I was struggling to see what I was doing. I may be totally blind by the time I'm finished this. It's quite a simple repeat but I still think it may be beyond my rather limited knitting intelligence.